The holiday season is a wonderful time to share family heritage and traditions with your kids. Many of us have holiday traditions that are connected to our ancestors and have been handed down through generations. 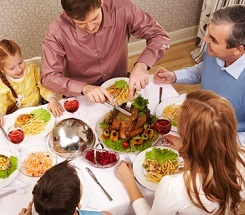 Often, children don’t realize why we eat specific foods during the holidays or follow certain customs – they just know that these activities have always been a part of the festivities. This year, make it a point to weave in some cultural education and family learning as you carry out your holiday traditions. Create a Book – Highlight family stories in a handmade booklet. Kids can write down family memories and draw pictures to match. They might also ask family members to write down their own stories and put them together in a family binder. Make a Family Tree – Beginning with their generation, have kids assign each member of the family a leaf with their name on it. They can then draw a large tree and tape the leaves along the branches to have a fun visual of their relatives. Family trees can also be made using natural items such as a large branch from the yard and pinecones or acorns with names taped to each. Record Family Stories– While visiting with relatives over the holidays, have kids use a video camera, iPad, or smart-phone to record family stories. Recordings can then be moved to DVD and shared with everyone. Where did your relatives live? Many kids are surprised to learn that their grandparents, and even parents, didn’t grow up in the same city where they live! Make a list of the various countries that relatives called home and then enjoy some fun activities as you learn more about your countries of origin. Map Your Family – Once you’ve learned more about where your family originated, use fun sticky notes to label the various countries on a world map. Talk about how members of your family met one another and moved to different places. Read Some Books – Go to the library and find some fiction and non-fiction books about each country. Kids will enjoy learning about the customs from other countries, along with some of the fables, folktales and stories shared with children in the country. Learn a New Recipe – With some of the days off from school, it’s a great time to learn a new recipe! You might try a new recipe that you learned about during your family interviews or one that you learned is a popular dish when reading a story about an ancestral country. Play a Game – Countries around the world have different games that children play. Kids always enjoy learning a new game, especially one that their great-grandparents may have played when they were younger! Talk to your kids about which holiday traditions have been passed down through generations. Maybe it’s a special cookie recipe, or what your family eats at holiday meals. It might be a special way you decorate or a yearly activity that you always do. Consider creating some new holiday traditions too! Ask kids what they enjoy most about preparing for the holidays and what new traditions they may want the family to begin. They may pass these on to their children some day, and with fond memories. Remember, traditions don’t need to be extravagant or complicated. Activities as simple as family movie night, baking together or decorating your child’s bedroom door is something your child will look forward to doing year after year.